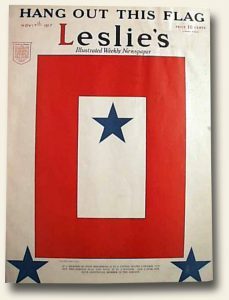 I traveled today to New York City by the way of the Leslie’s Illustrated dated November 17, 1917 . There I found the front cover that was famous then and has currently come back into use again. It features the red, white and blue service flag which was made famous symbolizing if a member of a household was in the military, one star for each member. With this cover, one was to cut out this flag and hang it in a window.